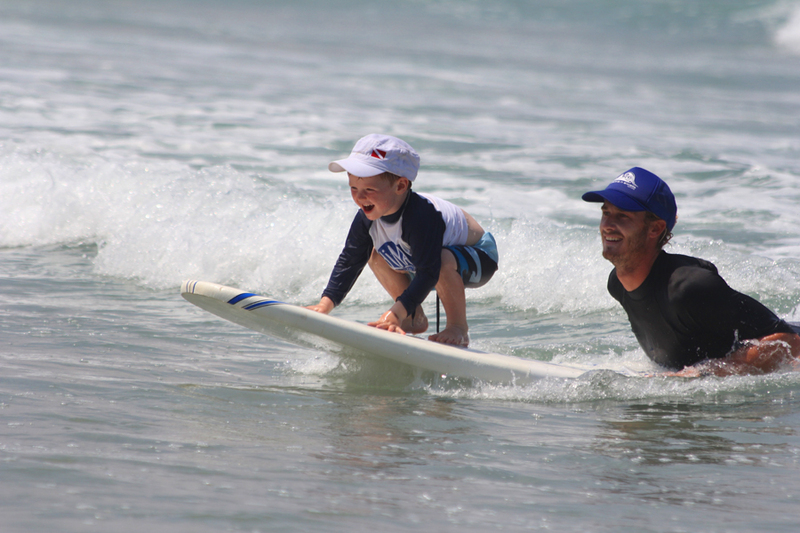 The family surf camps here at Peaks n’ Swells are our favorite weeks of the season. We love working with kids and seeing their confidence and enthusiasm grow with every wave they catch! Costa Rica offers a really friendly environment for beginners, with great surf for kids as young as 4. There are so many reasons to introduce kids to surfing– we had a hard time keeping this list to just 15! 1. Safe beaches. Playa Grande and Playa Hermosa, the two main beach breaks we surf, are very kid friendly. Both have sandy bottoms and a very gradual slope, meaning younger kids can catch great waves all day without going into water over their head. 2. The family that surfs together, has the most fun together. The beauty of our beach breaks (aside from the fact that Costa Rica has some of the most consistent waves in the world) is that both experienced and beginner surfers can be at the same break. While your kids catch the white water waves closer to shore, our coaches will get more experienced surfers out into more challenging waves. 3. 2:1 coach to kid ratio. We always have two coaches in the water with kids who are new to surfing—one to walk them out, and the other to “catch” them back at the beach. 4. Safety first. We spend time going over basic safety procedures with everyone at the start of the day. Kids will learn internationally recognized hand signals, how to protect their heads if they fall, and techniques for safely moving the board through the water. In addition to being certified lifeguards, our coaches help kids understand wave behavior and currents so they can feel confident and comfortable in the water. We typically start kids on a nice, big soft top board too. 5. Warm water! The water temperature in Costa Rica is about 80° F. No blue lips and shivering kids here! 6. Wildlife, fun and games. Costa Rica is known for its rugged coastline and abundant wildlife. 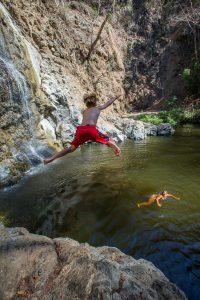 When kids need a break from the water, kids can scout out white face monkeys, stage hermit crab races, collect shells for art projects, start a pick up soccer game, crack open coconuts, go boogie boarding, or build forts in the trees. 7. Beach snacks. We always bring a shade tent and lots of snacks and cold water. Kids can take a snack break anytime. And while we’re never opposed to an ice cream run on the way home, our surf snacks are healthy and typically include fresh fruit, nuts, homemade muffins, and energy bars. 8. Safe and friendly culture. Costa Rica is a safe and friendly country, and a great introduction to international travel. The people here are very welcoming of visitors. Spanish is the local language, but most people speak at least some English, and our staff loves to practice Spanish with the kids. 9. Great food. Home to a number of Italian ex-pats, Montezuma has great pizza, pasta, fresh bread and gelato, as well as more typical Costa Rican fare. Even the pickiest eaters seem to love Jorge’s empanadas, and we haven’t had anyone turn down a Trit (the Costa Rican version of an ice cream sandwich)! 10. No kids club. 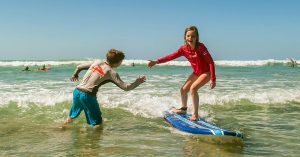 While we do plan a lot of activities for the families (beach bonfires, trips to the rope swing, palm tree climbing competitions, and art projects to name a few), we don’t check your kids into a separate program while you’re out surfing (see #2!). 11. Endless exploration. When the kids aren’t surfing, there are endless opportunities to explore the best that Costa Rica has to offer from camp. The Montezuma Waterfall is always a favorite, as is the Turtle Sanctuary in front of the camp. We are also happy to arrange snorkeling trips to Tortuga Island or horseback riding on the beach. Camp is just a few minutes walk from town, where kids can grab a fruit smoothie or explore the local shops. 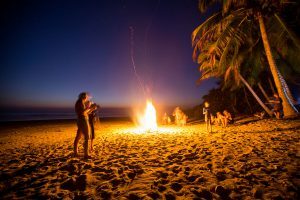 Peaks n’ Swells guest Emily Bradbury wrote about exploring the Nicoya Peninsula with kids on her blog, Adventure Travel Mom. 12. From our family to yours. Our camp is family owned and operated, and we’re the people you’ll see everyday. We’ll be in the water with you during surf sessions, and making your pina coladas at happy hour. Our family has been in Montezuma for 25 years and we’re so happy to share our local knowledge with our guests. 13. Professional photography. Our professional on-staff photographer will be snapping photos of you and your family all week long so you can bring all those memories home. Yes, we guarantee a great shot of you catching a beautiful wave, but we’ll also send you home with lots of great candids from your entire stay. 14. The pool. With the ocean just steps away, a pool might not seem important, but it’s HOT here and all of our guests (especially the younger ones!) take advantage of the pool on property. 15. They’ll be surfers for life! Every kid we’ve had here at camp leaves here a surfer. Bragging rights back home aside, surfing is an incredible sport that families can bring with them all over the world. Kids are such fast learners and once they have a solid foundation, they’ll be surfing for life! And, p.s., so will you. Read more about the benefits of learning to surf at a young age in this post. Already have a ripping little surfer? Check out our 5 Reasons to Visit Peaks n’ Swells as an Experienced Surfer. Hope to see you soon!